Acadia Stairs specializes in designing modern and contemporary staircases for the home. However, as evidenced by many of our straight stair designs, we are able to deftly blend tradition and innovation. Stringer stairs, which offer support for the treads, are renowned for being precise, durable and strong. The most popular option among our straight stairs is the single stringer stairs, which are sometimes referred to as mono or center stringer stairs. These stairs provide both a modern and elegant look. However, our double and pan-type stair options are also popular among clients searching for a specific look and increased durability. The double stringers are also a more economical option for our customers. 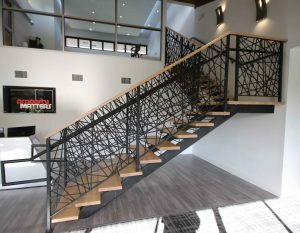 Our modern and contemporary straight stairs are open risers that you can see through; however, we can also close them if that is what the client desires. 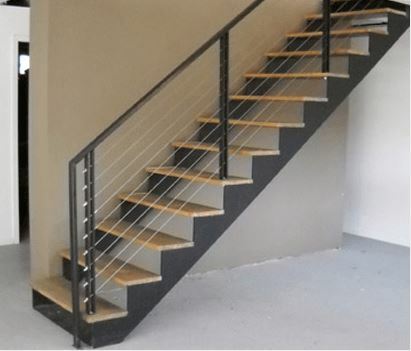 We will fabricate your custom metal stairs to your specifications, as we make them precisely to shop drawings. Additionally, we will ship our stairs to any place in the country. If you have any questions, or if you would like to learn more about the many options we offer, please contact us today. Acadia Stairs designs and fabricates stairs with steel or stainless steel stringers. The stringer, or stringers are the support for the treads. In having a steel stringer, the stair is very precise, durable and strong. These stairs can be made to have a much more open look than a typical wood box stair. Most of the stairs we sell are open riser stairs that you can see through, but we also make closed riser stairs. & combined with curved stairs or spiral stairs! 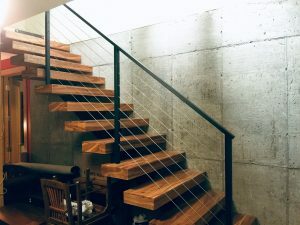 The single stringer staircase is composed of a triangular frame. This stair is extremely rigid while giving the most open look of any stringer stair available today. This double stringer staircase has a modern railing system. 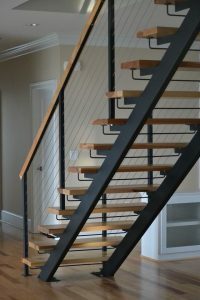 This architectural stair system is perfect for an open look and goes well with cable rails or welded railing systems. Shown here is a pan-type staircase with the stringer channels at the outer perimeter. This stair has an open riser. The treads are flanged down in the front & up in the back for reduced riser spacing. 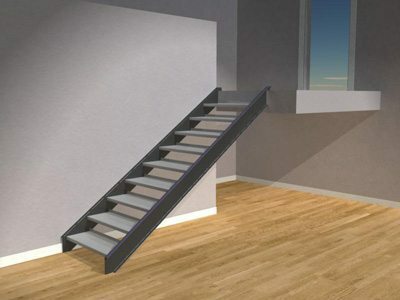 The staircase can receive nearly any type of handrail.